"Valerie was absolutely amazing! She worked with us to create the perfect ceremony that fit both of us, and showcased our relationship. The day of our wedding she was well prepared, on top of all the details we needed, and executed the ceremony flawlessly. I would strongly recommend her to anyone looking for an officiant." Perfectly situated in Queensbury, New York, North Country Nuptials has officiated all types of weddings from the Capital Region of Upstate New York to the Adirondacks. North Country Nuptials provides professional wedding officiant services. Whether you are looking for an intimate romantic elopement or a grand formal affair, North Country Nuptials has you covered. Weddings have evolved, especially over the last 10 years. Today’s couples are looking for fresh alternatives to traditional weddings. We will listen to your ideas and offer some of our own as we get to know you and your wedding style. 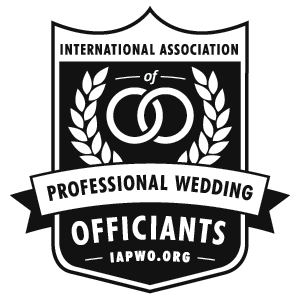 As a member of the International Association of Professional Wedding Officiants, we adhere to a strict code of ethics. We continually update our skills and best practices through regular training seminars for wedding professionals as well networking groups. We are fully insured with a $1,000,000 liability insurance policy that is often required by wedding venues. As a proud partner of the Adirondack-Albany Wedding Association, North Country Nuptials is a preferred choice of several top-rated wedding venues and professionals throughout Upstate New York. If you are in the initial wedding planning phase, we recommend you contact AAWA and take advantage of their free wedding planning services. They offer a discount program that helps provide some significant savings when hiring your wedding vendors. We happily participate in this program. We work collaboratively with your wedding professional team to ensure your wedding ceremony is perfect from managing your wedding rehearsal, creating your personalized custom vows, wowing your guests with a fabulously presented ceremony to completing and filing of all the legal paperwork. Optional services include day of wedding coordination for DIY couples and/or rustic wedding locations. The Adirondack Region of Upstate New York is a premiere destination wedding locale. We love destination weddings! Because we call the Adirondack Region our home, we have a wealth of knowledge and experience for so many options for your Adirondack Wedding. We communicate with you and your wedding team via phone, e-mail and Skype to help you plan your perfect destination wedding. Contact us to discuss how we can make your wedding ceremony the centerpiece of your day. Initial consultations are always free and we looking forward to meeting you! For the past three years I have been happily officiating weddings on the weekends in the Lake George region of Upstate New York. During that time, I continued to work full time from home for a group of orthopedic surgeons obtaining authorizations from insurance companies. Pretty mundane stuff, but it paid the bills and I … More Leap of Faith! Leave a comment Leap of Faith!